Paul Kagame's election is seen as assured after 98 per cent of Rwandans approved a constitutional amendment in a 2015 referendum that granted him the right to run for a third term in office. Observers condemned the reform, which could potentially see Kagame seek re-election twice more and remain in office until 2034. Rwandans vote in a presidential election today widely expected to return strongman Paul Kagame to office for a third seven-year term at the helm of the small east African nation. Kagame, 59, is facing two little-known candidates who have made little impact in only three weeks of campaigning against the incumbent and his all-powerful Rwandan Patriotic Front (RPF). Tens of thousands of cheering supporters, waving little red, white and blue flags, feted Kagame at his final rally Wednesday, praising the man who halted the 1994 genocide and has been de-facto leader of Rwanda ever since. “I support President Kagame because he stopped the genocide and because he brought development to Rwanda,” said supporter Ngendahimana Narcisse. In contrast, only a few hundred people have attended the rallies of Frank Habineza of the Democratic Green Party — the only permitted critical opposition party — and independent candidate Philippe Mpayimana. 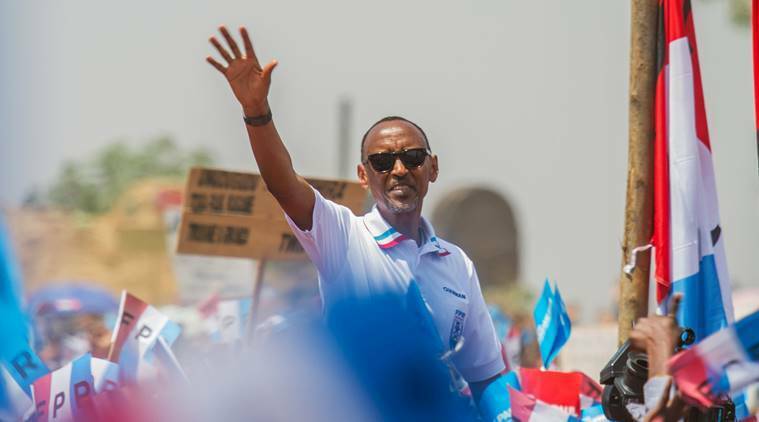 The opponents have complained about the limited time given to fundraise and campaign, which critics see as further evidence of Kagame’s clampdown on the opposition. “It is short, we would have liked at least two months. Towards the end of the campaign the number of people at our rallies increased a lot,” said Jean-Claude Ntezimana, the executive secretary of the Green Party. Habineza told AFP at a recent rally that putting up banners and posters had also been a challenge. “They told us we cannot put our banners or flags where the RPF’s things are, but unfortunately the RPF put theirs almost everywhere,” he said. Kagame’s election is seen as assured after 98 percent of Rwandans approved a constitutional amendment in a 2015 referendum that granted him the right to run for a third term in office. Observers condemned the reform, which could potentially see Kagame seek re-election twice more and remain in office until 2034. Kagame, a lanky former guerrilla fighter, was just 36 when his rebel army routed extremist Hutu forces who slaughtered an estimated 800,000 people — mainly minority Tutsis — and seized Kigali. He served first as vice-president and defence minister, although he was widely considered the de facto leader of the country and was appointed as president by lawmakers in 2000. He was first elected to the post in 2003 and again in 2010 with more than 90 per cent of votes. He is credited with a remarkable turnaround in the shattered nation, bringing stability and annual economic growth of about seven percent. However, rights groups accuse him of ruling through fear, relying on a systematic repression of the opposition, free speech and the media. Critics have been assassinated, jailed or forced into exile, and some observers believe the only reason Habineza and Mpayimana have been allowed to run is that they pose no threat. “There is no election in Rwanda, there is a coronation declaring Kagame the king,” outspoken local journalist Robert Mugabe told AFP.